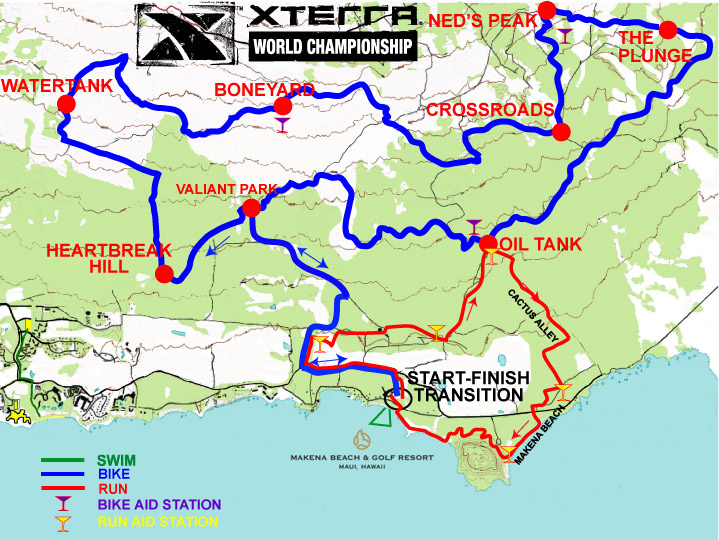 Looking forward to Terrascape representing at Xterra World Championships next year! We arrived at the race and headed straight for transition on the beautiful Makena Beach golf course. It was warm out already which was so nice; a change from the usual freezing race mornings I am used to in Canada. I got my transitions set-up and headed to get body marked. It was a very relaxing morning with only 600 racers and hardly and lines to get things done. I wandered around and found other Calgary folks who were not racing - they were all amazing support. Lots of hugs and high-5's to calm any nerves. I found Madi and we warmed up. Then, all racers were called out of the water to get a Hawaiian blessing by Reverend Alalani Hill, before heading to our preferred starting spots amongst the other athletes for the mass beach start. I found Kristie Schneider and we stood on the beach together in the crowd of racers. We laughed that we were actually here at the World Championships! The helicopter swirled overhead making it seam even more surreal! Finally the cannon went off; we screamed, grabbed each other’s hands and dove in. I got into a rhythm fairly quickly and focused on swimming to 1 buoy at a time (it was crowded but surprisingly I did not get kicked or punched). Each time I hit a buoy I would not allow myself to focus on more than the next buoy. This made for a more relaxing swim as I tend to focus how much more swimming I have to do. I finished the first lap and came out to run the 75m beach run before diving back in for the second lap. My heart rate had skyrocketed due to the beach run and I struggled to get back into a rhythm again (that and the fact that the waves had picked up and made it very hard to sight or take smooth strokes). I also got a few mouthfuls of salt water due to the waves. 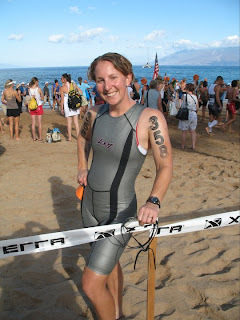 Despite the rough lap, I couldn’t help love that I was swimming in the ocean. I stayed very happy throughout the swim. T1 went well and was fairly fast. I was organized and knew my routine. I grabbed my bike and off I went. I was very excited, yet very nervous to get on my bike. 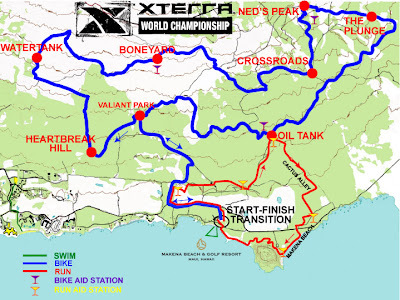 Normally with mountain bike racing you pre-ride the course but, at the Xterra World Championships they do not let you pre-ride the course. It is read and react as you go. This weighed on my mind as I headed out of T1. I got one entire bottle of Eload down before we got into the climbing section, as that was what Jordan had told me to do. Then up Heleakala – all the way up to 1400 feet. I worked to stay calm, at my appropriate heart rate, and continued to get calories in. The course was congested and so many people were on the side with flat tires. I also passed a girl who had fallen and her shift level had actually punctured her arm! Luckily medical staff was already there. We continued to climb for several miles and I worked to stay hydrated, keep getting calories in, and enjoy the experience. The lava rock was definitely interesting to ride on, and you had to worry about the lava rocks actually slicing the side walls of your tires if your tire pressure wasn't right or you hit the lava rock the wrong way. There were also the crazy Kiawe thorns that could puncture your tires. Many competitors were on the side with flats. I prayed for no flats. When we finally hit the downhill I loved it. Not technical enough for my liking, but still so much fun! I took very aggressive lines on the way down trying to make up time for being so slow of a climber. I didn't really seem to make up very much time though, as during the uphill sections I got caught by many of the people I had worked so hard to pass on the downhill sections. I took it a bit easier and enjoyed some of the views from Heleakala as we headed back towards Makena beach. 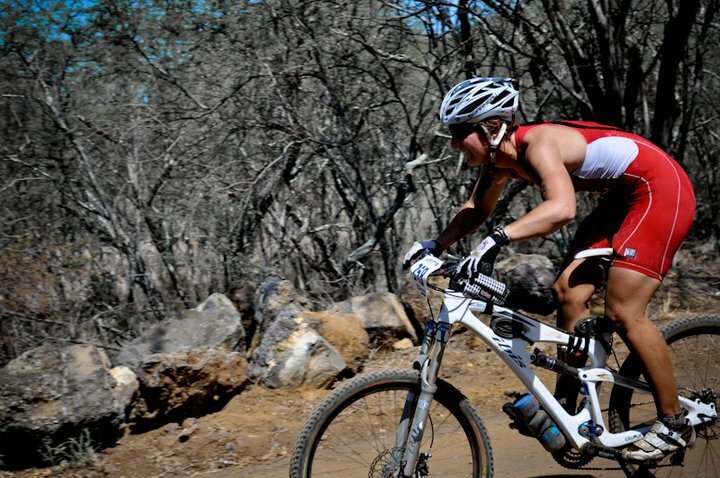 I was feeling great off the bike and heading into transition. 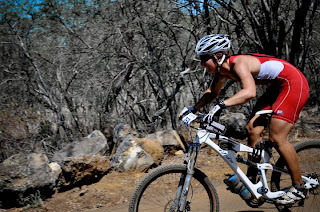 I had paced well on the bike and had gotten in enough calories (not the usual case for me in an Xterra). I found my bike rack right away, as a competitor I had met in transition had placed a bright orange shoe lace on the sign for our rack. I scrambled to get my bike gear off and gather all of my run gear as the helicopter swirled overhead (I knew this meant the first pros were finishing). It was loud and chaotic and I tried to yell Rose that Madi was OK out on the bike course. I was rushing and when I started to run I realized I went in the wrong direction out of T2 and had to run back the other way to the run exit. I was like a chicken with my head cut off. Worst T2 ever for me! But hey, I had made it onto the run. As I headed along the road I felt like I was taking the shortest, baby steps and moving nowhere! I was running but, because so many others were running so well it magnified how slow I was going. I was happy though. I was on the run of the Xterra World Championships and I had survived the swim and bike thus far! I did pass a few walkers and tried to encourage them but one girl said “English, I don’t speak well”. Oh right, this is the World Championship. 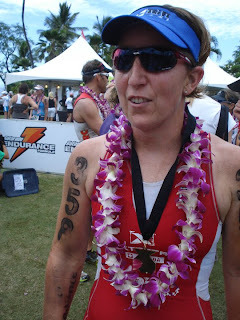 When I hit the climb I just tried to push forward with a combo of walking and running; survival under the Hawaii sun. I walked ever water station with the routine of asking for two waters – one to drink, and one to dump on my neck in an attempt to cool. When we finally turned to go down, I quickly realized the down would not be much of a reprieve. I ran as fast as I could on the loosest, rockiest, gnarliest terrain I have ever seen. I went over on my ankle and when I can back up couldn’t believe my ankle was OK. However, my toes started tingling and the side of my foot ached. 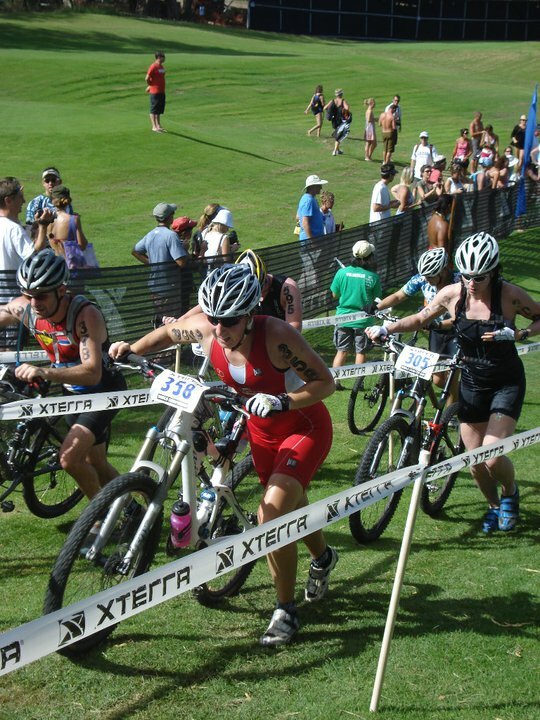 I sucked it up because that is what Xterra athletes do! I focused on running strong while having fun on this amazing course. 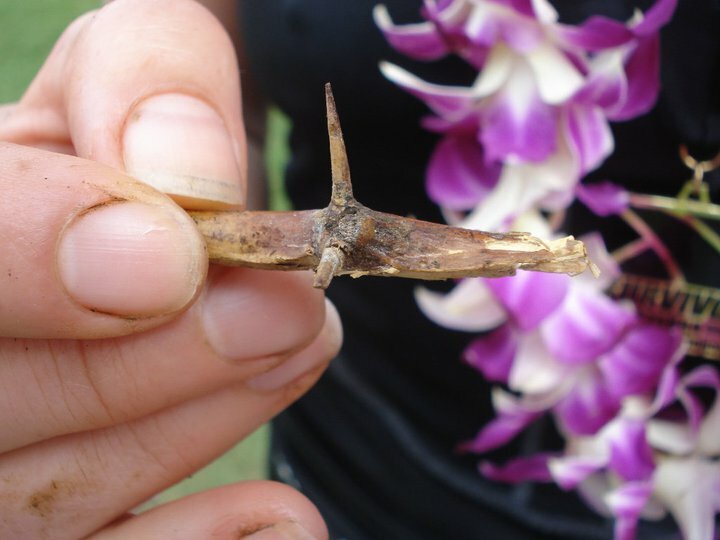 When I hit Makena beach, which was the first beach run (a ¾ mile beach run), I worked hard to remember to shuffle and not push off to hard so I wouldn't sink in the sand. A lovely competitor with whom I had been on the bike with passed me and offered me an ice cube. So nice! The beach seemed to go on so long and I was thrilled when the flags directed us up off the beach. Next up I hit the spooky forest – over and under trees and logs. I was so tired and very worried I would hit my head, or trip over a log and land flat on my face but I managed to get through the forest without incident. 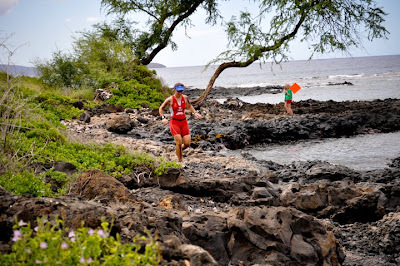 Then, the next beach run which was thankfully fairly short, and then onto more lava rock! I walked/ran, trying not to slip as I knew I was so close to the finish. I was relieved to hit the golf course grounds. I jumped over the last rock wall, and ran strong headed for the finishing shoot. 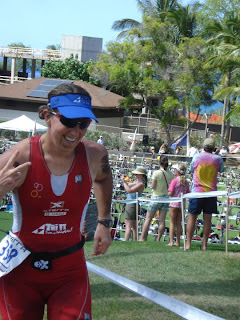 I was so excited to see so many friends as I headed into the finishing shoot and crossed the line. 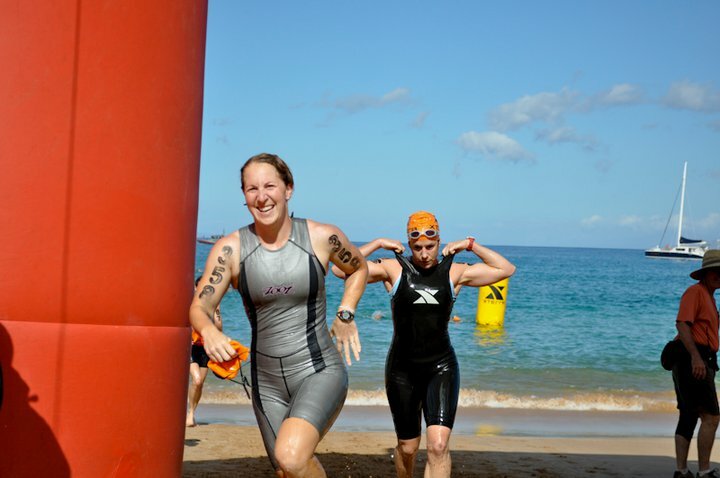 I survived the Xterra World Championships!